Home / Mobile / Can You Poynt Me In the Right Direction? Can You Poynt Me In the Right Direction? One of the reason why I upgraded to the Blackberry Storm is because I want to be able to do mobile search. As the Storm is only a few months old, the number of Storm optimized apps are few but they are growing. Being new to Blackberry also, I am quickly trying to get myself acquainted with the apps that are currently out there. Being that I am in the local search sphere, this is the first place I looked for apps. A few weeks back, I came across a video about Poynt from Multiplied Media from the CES 2009 conference. The app looked really cool, so I contacted the company to see when a Storm version would be available. Margaret Glover-Campbell, Director, Marketing & Communications, quickly wrote me back and said it is coming soon. Well that day has arrived! Today Febrary 12, 2009, the Blackberry Storm version of Poynt is available. Margaret, who happens to be a LocalBizBits reader, and member of Local Search Central was able to hook me up with a copy last week. Overall this is a great app for the Blackberry Storm. This is no beta-no bugs (or at least none that I could find). Just a FREE, simple to use tool for local mobile searching. As I told Margaret, I wanted to start driving around town with my phone to find and map new places using Poynt. 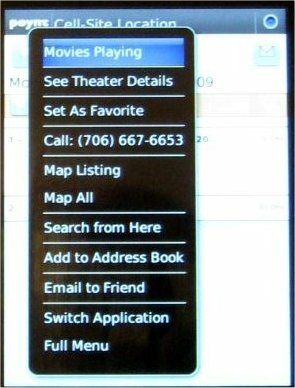 With Poynt, you have 3 main options- search business (via Superpages), search movies/theathers, and map what you need, using Blackberry maps or Google Maps. There are two ways Poynt finds you and the business locations, via the built in GPS or with cell tower locations. Poynt makes it very easy to do local search on the Blackberry Storm, I highly recommend it. As I find more local search apps for the Storm, I will post my thoughts on them. Poynt’s UI was developed specifically for the BlackBerry Storm to provide users with a true touchscreen experience. Poynt is fully integrated with both BlackBerry Maps and Google Maps, with turn-by-turn directions provided through Google Maps. Users can add frequently accessed listings to their address book, providing convenience for future look ups. Share Search Results Integration with email allows users to easily share listings with friends and colleagues. Users can plan their movie selections, watch trailers, viewing show times, read reviews, cast and synopsis and purchasing tickets. Users have the ability to add movie results to their calendar by date and showtime, as well as invite friends to join them. They also have the option to include the ticket purchase link. 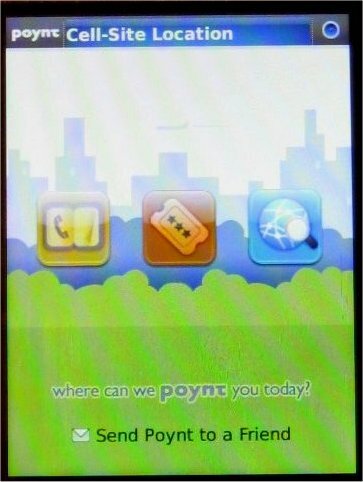 Now Poynt is not new; it launched on the BlackBerry smart-phones in June 2008.Â Right now the user count is over 50,000 downloads. So how to get Poynt for Blackberry? This local mobile search app, is available for those BlackBerry models 8700 and higher with a minimum v4.2.1 OS. To download Poynt OTA (over the air), go to http://m.mypoynt.com from your BlackBerry Browser. Thanks again for this cool mobile search app. Stay tuned, Part 2 of this post is my interview with Andrew Osis CEO of Multiplied Media. Weekly movie group, during the week we pick and send options to all and pick one; including theatre, time,map location if needed. Found the pistachio ice cream from a specialty ice cream shack; which is now her favorite. Fantastic, can’t see how it was done before.